Hortus Camdenensis | Nivenia corymbosa Bak. Fibrous root stock, linear leaves on long, branched stems and sweetly-scented blue and yellow flowers on a much-branched, many-flowered inflorescence. [RHSD, Grey]. ‘Few plants are more pleasing in the colour, or more lasting in the duration of their blossoms. […] It was introduced about the year 1803 by Mr. Hibbert.’ [LBC no.254/1818]. ‘A new species, probably the first of the genus ever cultivated in our European gardens.’ [BM t.895/1805]. ‘Although introduced into Britain many years ago, it does not appear to be in cultivation now.’ [Grey]. MB p.269/1836. Only listed in the 1843 catalogue, the earlier introduction probably lost as it was included among desiderata to Loddiges’ nursery, 6th January 1845. [MP A2933-2 p.28]. Witsenia corymbosa was ticked in a copy of the Horticultural Register, November 1831. Although this originally belonged to James Bowman, it is likely that this plant was grown by members of the Macarthur family earlier than 1843. [N.Herb.L. copy]. 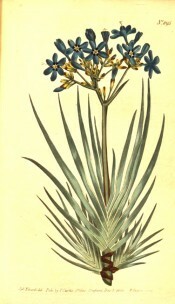 Aristea corymbosa Benth. & Hook.f.